Diplomate and Board Certified Quantum Academies, Beverly Hills, California, USA. Molecular Biologist with HONORS, University of Delaware, U.S.A.
1. Holistic Nutrition, Highest Honors, U.S.A. 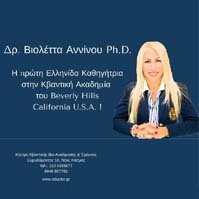 Candidate Ph.D. in Quantum Integrative Medicine, U.S.A.
By Dr. Violetta Anninou, Ph.D.
Quantum Biofeedback has proven to be helpful in reducing stress and hypertension that may be associated with illnesses and / or physical or emotional injuries. High blood pressure can cause stress in the body or be caused by intense stress.